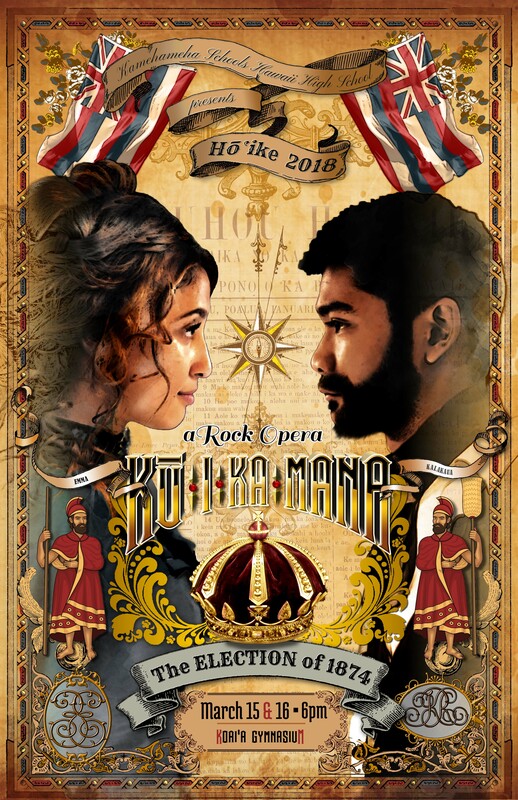 Kamehameha Schools Hawaiʻi announces their upcoming hōʻike, Kū I Ka Mana, which will share the drama and political intrigue behind the election of 1874 between King David Kalākaua and Queen Emma Rooke, as the death of King William Charles Lunalilo left the Kingdom of Hawai‘i without an appointed successor to the throne. 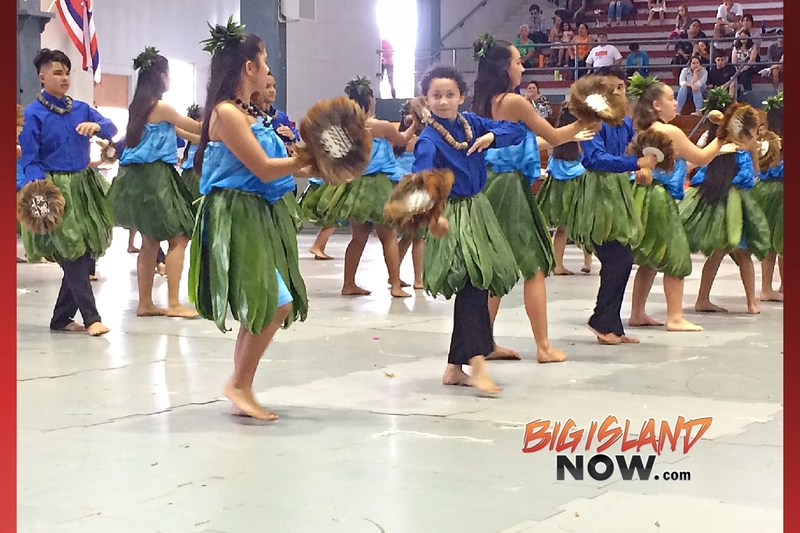 Two shows are open to the public—Thursday and Friday, March 15 and 16, 2018, at 6 p.m. in Koaiʻa Gymnasium on the KS Hawaiʻi campus. Tickets are $5 and available for purchase online, at the door on the night of the performance, or at the high school office or Student Activities Center after school from 3 to 4 p.m. on school days. 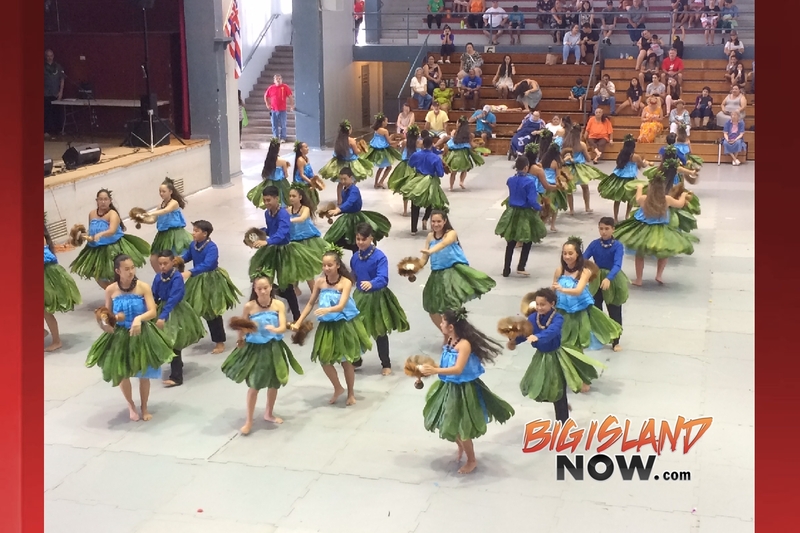 Funds raised from hōʻike assist students with travel costs for participation in worldwide events, including performances at the 2019 Edinburgh Festival Fringe. Kū I Ka Mana dramatizes in music and dance the events leading up to the election of 1874 after the death of William Charles Lunalilo left the Kingdom of Hawaiʻi without an appointed successor to the throne. In the running are Queen Emma, beloved by the people, and the charismatic David Kalākaua. In this telling, Bernice Pauahi Bishop also considers being part of the election, having second thoughts about having refused the crown when offered to her by Lot (Kamehameha V) before his death. The results of the election would have lasting repercussions on the Kingdom of Hawaiʻi, setting the stage for many of the events that have shaped the history of the state. Kū I Ka Mana will be presented as a rock opera in two acts with libretto by theater Kumu Eric Stack and music by Choir Director Herb Mahelona. The entire production is designed around a Steampunk theme in keeping with the genre of music. The production will be presented in English and Hawaiian. 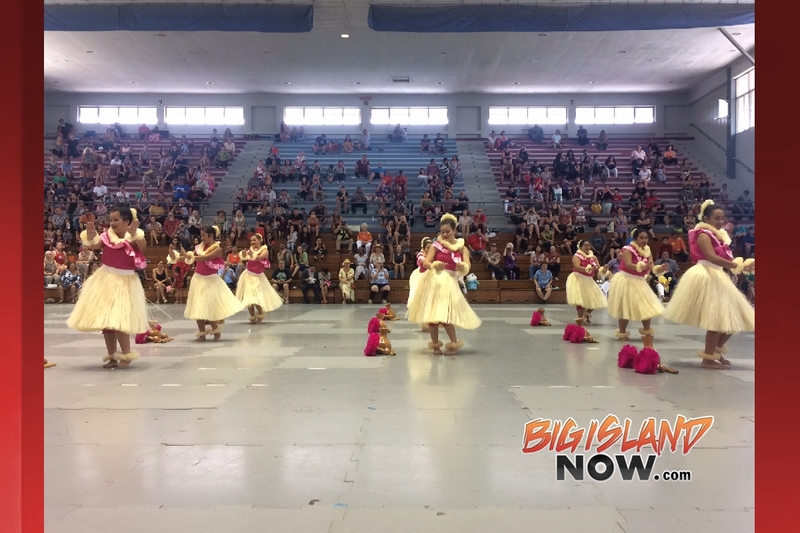 Kamehameha Schools Hawai‘i High School presents its hōʻike annually in the spring as an all-school event. All high school students participate in the production as actors, dancers, musicians or crew. This year, the production will also feature the KSH Elementary School Keiki Choir and the Mamalahoe Chapter of the Kamehameha Alumni Chorus. All hōʻike productions focus on some aspect of Hawaiian history or culture presented to the public with the goal to educate our haumāna and to share with the community. 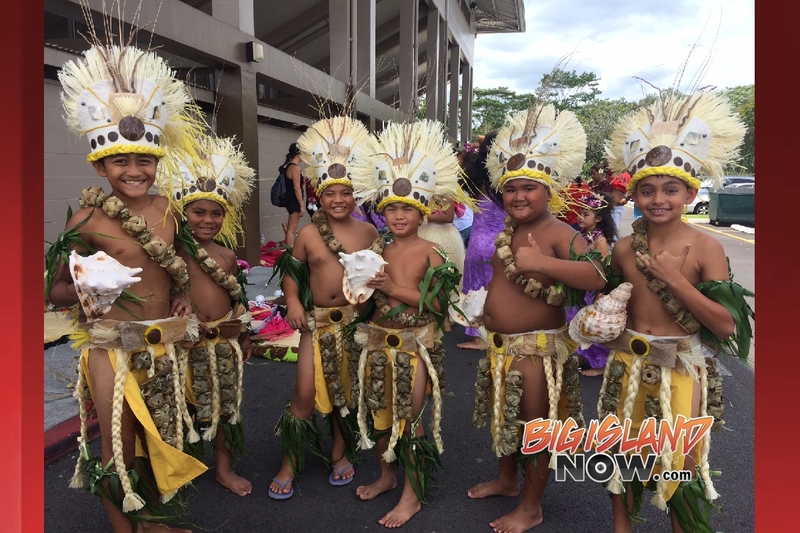 It is a unique opportunity to celebrate Hawaiian culture, history and language and to instill pride and appreciation for things Hawaiian. 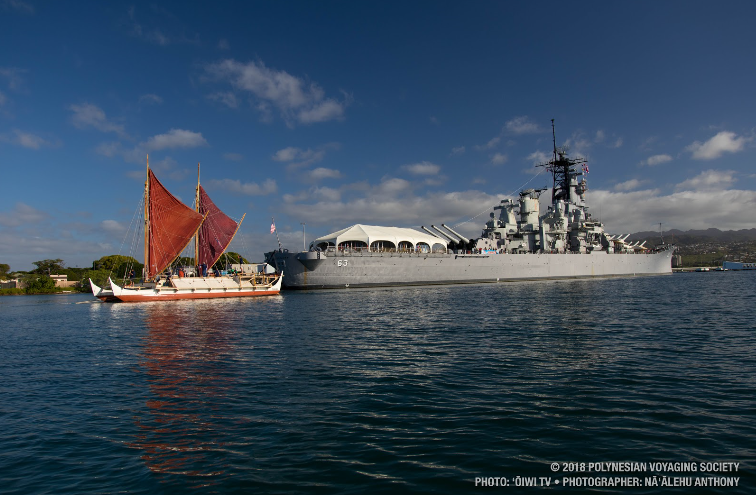 For the first time in Hōkūleʻa’s 42-year history, the legendary canoe sailed into the waters of Pearl Harbor this morning, Saturday, Feb. 10, 2018, and was welcomed by the Puʻuloa community, elected officials and the US Navy at Rainbow Bay Marina. 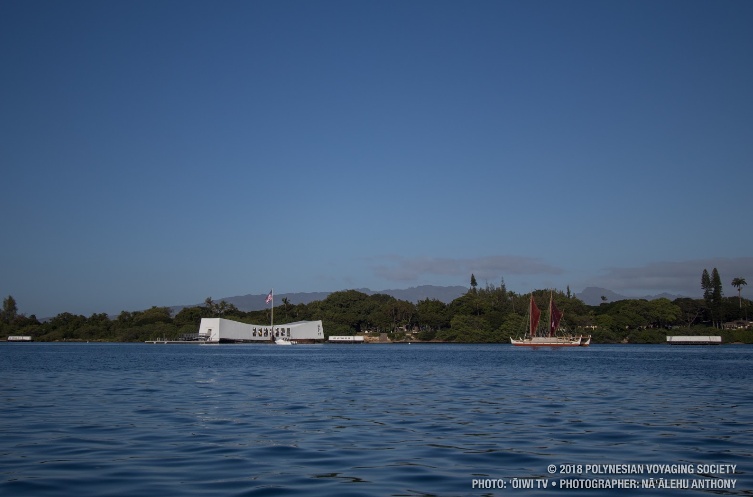 Entering the mouth of Pearl Harbor at approximately 8 a.m., the arrival began with a greeting, or rendering honors, between Hōkūleʻa and three Navy ships: the USS Hopper, USS Chafee, and the USS Chung Hoon. 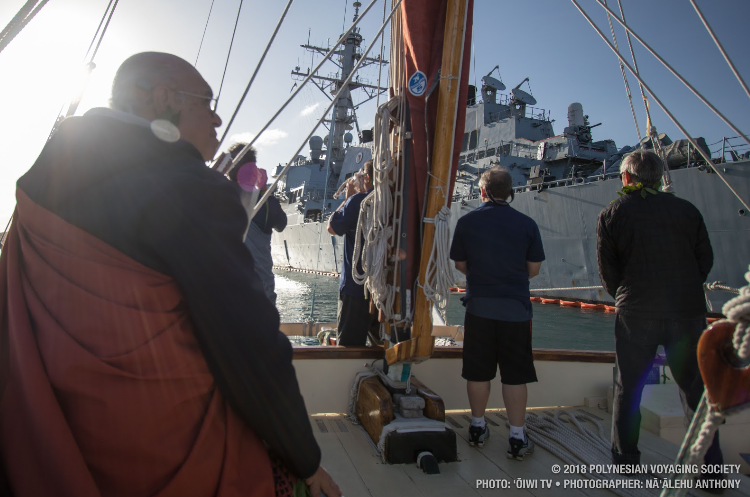 Sailors saluted from the decks of the three ships and blew a ceremonial whistle to honor the canoe’s arrival and Hōkūleʻa’s crew responded by blowing a pū (conch shell). 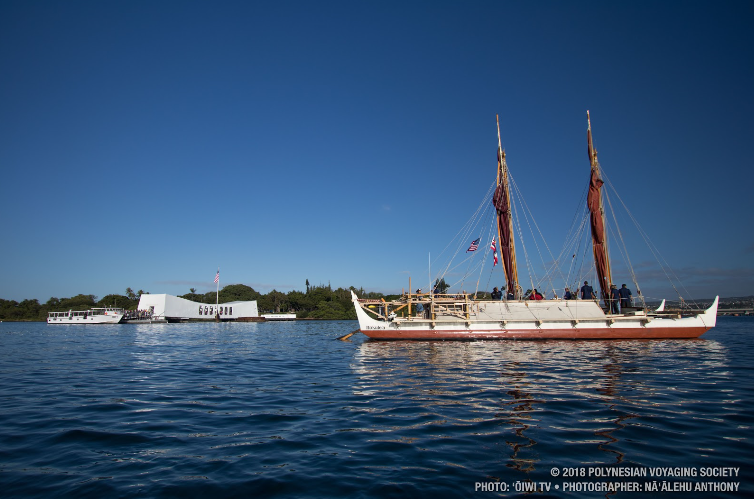 The sail into Pearl Harbor continued with Hōkūleʻa sailing and paying respects by blowing the pu and scattering plumeria flowers at cultural and historical sites throughout the harbor including Halealoha Halemau (Fort Kamehameha Reburial Platform), USS Nevada, Arizona Memorial, Battleship Missouri, Ford Island, USS Utah and Loko Paʻaiau Fishpond. During the brief stop at Loko Paʻaiau Fishpond, a hoʻokupu of fresh fish was handed to a canoe paddler who delivered the special offering to the sacred side. Loko Paʻaiau fishpond is located at McGrew Point Navy housing and is one of only three fishponds out of an original 22 in the Pu’uloa area which are still relatively intact. In September 2014, the Navy invited members of the local Hawaiian civic clubs and ʻAiea community members to begin work on restoring the historic fishpond. As Hōkūleʻa approached and docked at Rainbow Bay Marina, the crew was welcomed with traditional Hawaiian protocol including chants and a hula performance by ʻAiea High School. Welcome remarks were made by Rear Adm. Brian Fort, commander of Navy Region Hawaii and Naval Surface Group Middle Pacific; Representative Aaron Johanson; Councilmember Brandon Elefante; and Winston Lum of the Aliʻi Pauahi Hawaiian Civic Club. Hōkūleʻa is scheduled to be docked at Rainbow Bay Marina until Saturday, Feb. 17. The week-long engagement will include school visits, public dockside tours and a crew talk story event. 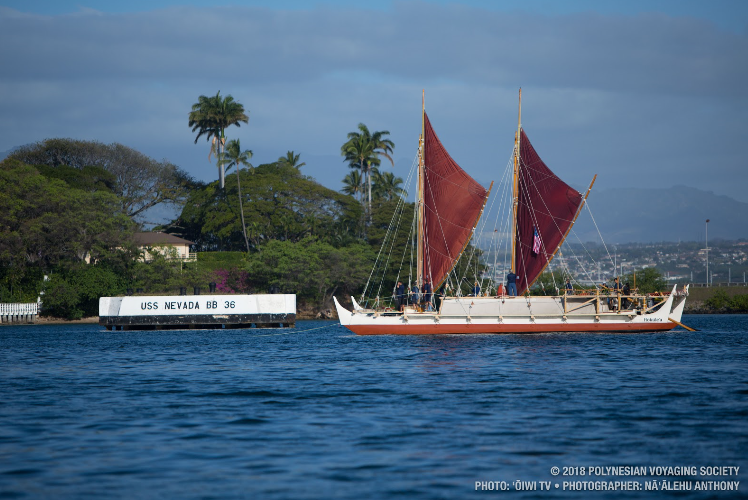 As part of the Mahalo, Hawaiʻi Sail, the purpose of Hōkūleʻa’s visit is to bring the canoe to more of Hawaiʻi’s children, honor Pearl Harbor’s ancient culture and history, and to learn about the efforts to restore the area’s cultural sites including Loko Paʻaiau Fishpond. 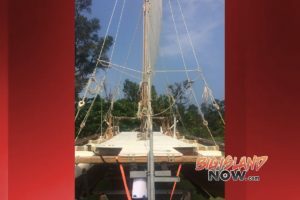 More than 1,000 school children are scheduled to visit Hōkūleʻa and participate in educational activities during her stop at Puʻuloa. 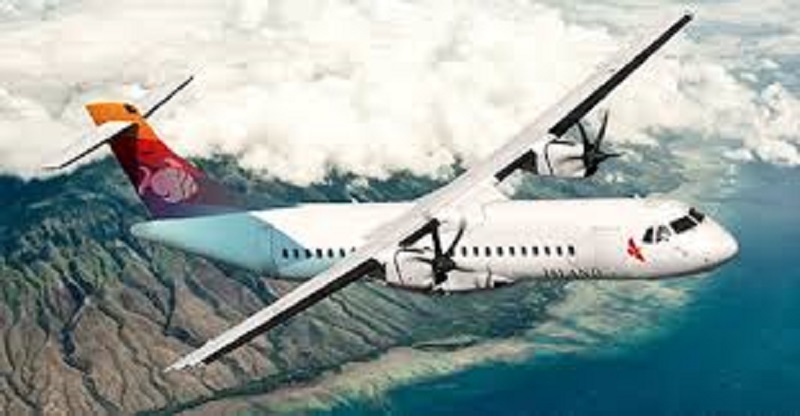 In addition to the upcoming Nov. 18 Honolulu Open House for former Island Air employees announced last week, Hawaiian Airlines has confirmed additional job fairs in Kona, Kahului and Līhu‘e. These sessions are reserved for displaced Island Air workers. The Kamehameha High School Hawaiʻi Island campus will hold it’s annual fall musical Thursday through Saturday, Nov. 16 through 18, 2017. 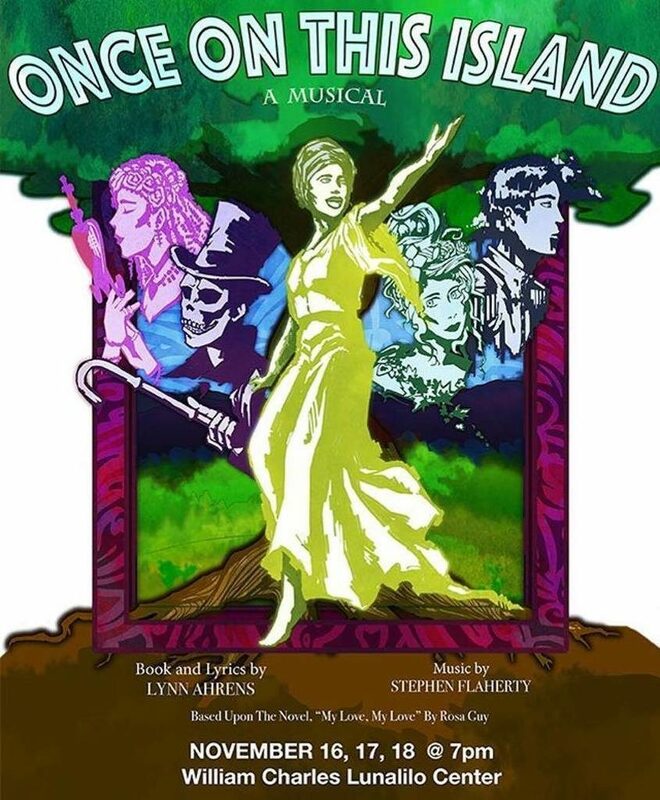 This year’s musical is Once On This Island, based on the novel My Love, My Love by Rosa Guy. The musical portrays how a peasant girl from Haiti falls in love with a wealthy French boy from the other side of the island, but comes to the realization that love, just like life, can be complicated. The shows will be held in William Charles Lunalilo Center and will begin at 7 p.m.
Tickets are $5 and will be available for purchase starting on Monday, Nov. 13, at the high school office from 3 to 4 p.m. or at the door right before each show. The William Charles Lunalilo Center is located on the campus grounds located at 16-714 Volcano Road in Keaʻau. For more information, call Eric Stack at (808) 982-0713. The public is invited to attend the centennial observance of the passing of Queen Liliʻuokalani on Saturday, Nov. 11, 2017, at the Hawaiʻi State Capitol at 8 a.m. The public is invited to gather with Royal Orders and societies, cultural practitioners, kānaka, leaders of Ali‘i Trusts and dignitaries at the Queen’s promenade and statue on the grounds of the Hawai‘i State Capitol on Saturday, November 11, 2017 at 8:00 a.m. for Aloha Lili‘u, a centennial observance of the life and legacy of Queen Lili‘uokalani. Over 100 churches across the state will toll their church bells at 8:30 a.m. in honor of the last reigning monarch in Hawai‘i, replicating the moment of her passing on November 11, 1917. 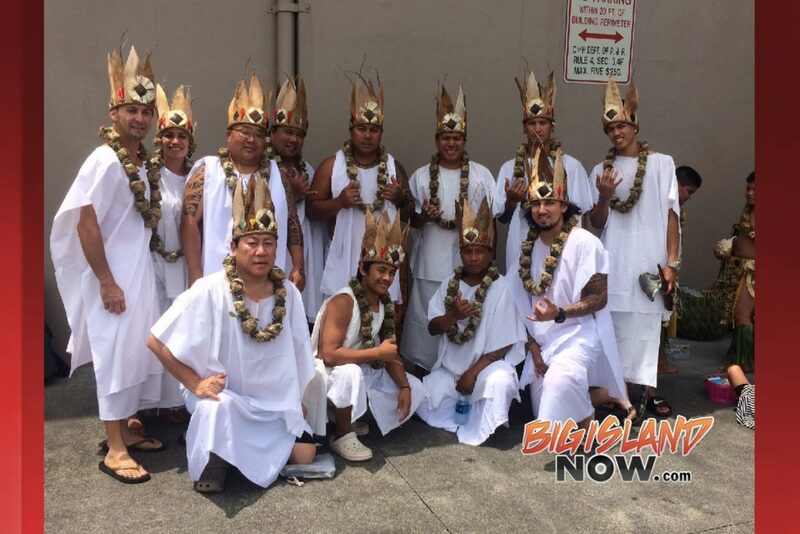 In addition to the bells, there will be 100 conch shell blowers (pū), as well as hula dancers (‘ōlapa), drums (pahu), and chanters (mea oli) from across the islands to pay homage to the Queen. The program that morning will include pieces written by Queen Lili‘uokalani, performed by Hawaiian musicians Marlene Sai, Manu Boyd, Owana Salazar and the Aloha Lili‘u Choir led by Nola Nahulu. For more information on Aloha Lili‘u, please visit www.alohaliliu.org. Hundreds of people came out to ʻImiloa’s 10th Annual Wayfinding Festival held on Sunday, Oct. 29, at the ‘Imiloa Astronomy Center of Hawai’i. 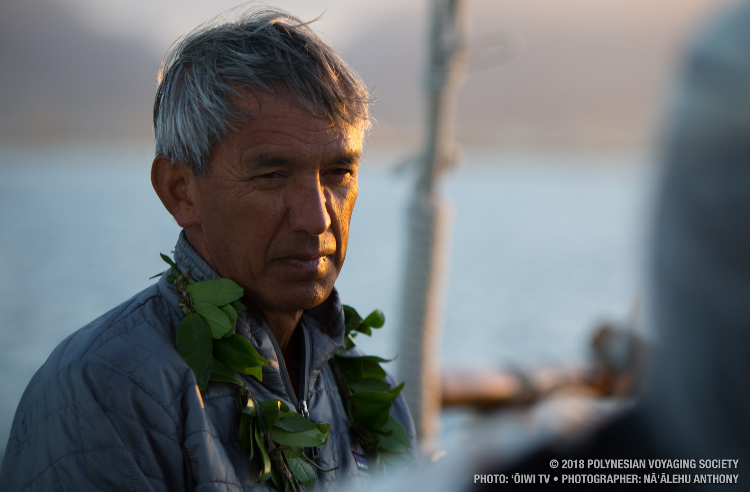 This year’s theme was “Bringing Home Lessons” of the Worldwide Voyage and featured a panel discussion with crewmembers from the recently completed Mālama Honua Worldwide Voyage, along with wa‘a (canoe) activities themed around Hawai‘i’s iconic double-hulled sailing canoe, Hōkūleʻa. Tools used in Wayfinding made by Kona resident Gary Eoff. 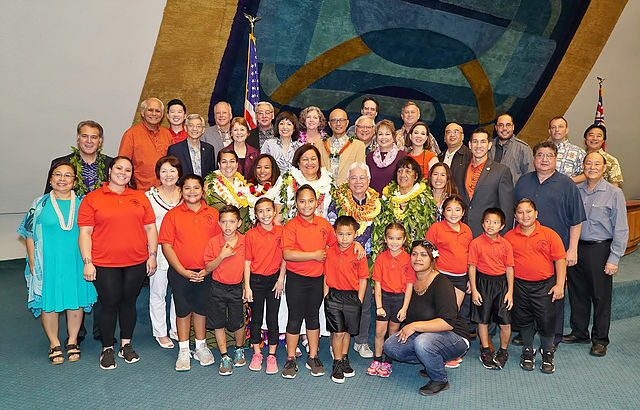 Attendees learned about the historic 3-year journey of Hōkūleʻa, which traveled 42,000 nautical miles, visiting 150 ports in more than 20 countries, while training a new generation of navigators, educators, scientists and community stewards. Voyaging Canoe “Kiakahi” out of Keaukaha, Hawaiʻi Island. This year, the festival also reprised the popular Waʻa Iron Chef Contest. In addition to keiki activities, special wayfinding planetarium programming were held in the theaters and planetarium. 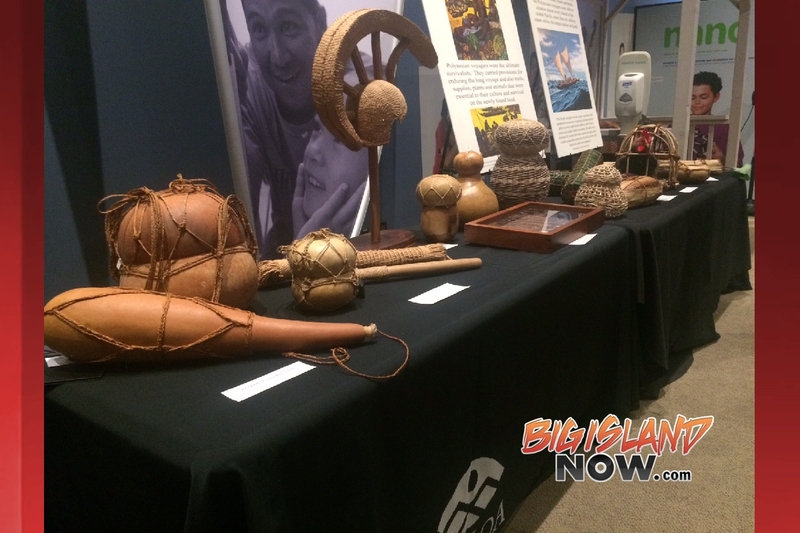 The public also had full free access to ʻImiloa’s interactive exhibit hall. The 10th Annual Wayfinding Festival is sponsored by the Ama OluKai Foundation. A statewide campaign to commemorate a landmark anniversary for Hawaiian language education continued over the weekend by The University of Hawaiʻi at Hilo’s Ka Haka ʻUla O Keʻelikōlani College of Hawaiian Language. Students helped design and create ten Living Legacy Murals, inspired by the mo‘olelo (story) of Kalapana. Led by graffiti artist John Prime Hina, ʻĀuna Pāheona, a group of art-centric individuals, have been traveling the state since August. 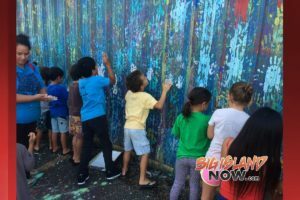 The group is engaging local artists and Hawaiian Immersion schools to design and create the murals, which are being painted one-by-one, culminating on May 25, 2018 in Hanapēpē, Kauaʻi. The story of Kalapana involves his mother, Halepākī from Kauaʻi and his father, Kānepōiki from Kona, who dies when he loses a hoʻopāpā (battle of wits) challenge from Kaua‘i chief, Kalanialiʻiloa. When he matures, Kalapana travels to Kaua‘i and avenges Kānepōiki’s death by winning his hoʻopāpā challenge through his knowledge of the winds, rains, plants, songs, and ʻai (tools) that are unknown to Kalanialiʻiloa. ʻĀuna Pāheona worked with Ke Kula ʻo ʻEhunuikaimalino to complete the first mural in Keauhou, Kona. They are now nearing completion of the second painting in Nānākuli on Oʻahu, working with Ke Kula Kaiapuni o Nānākuli. The first two installments focus on Kalapana learning hoʻopāpā with his mother, Halepākī, and aunt, Kalaoa. The Hilo mural, located at 51 Makaʻala Street, will depict Kalapana unofficially putting his hoʻopāpā skills into play after completing his schooling with Kalaoa, then going to Kauaʻi where he encounters a local of the area. Painting participants will include teachers, students and ʻohana from Ka ʻUmeke Kāʻeo, along with Hawaiian language students from KHʻUOK and the Hawaiian medium laboratory school Ke Kula ʻo Nāwahīokalaniʻōpuʻu. The Ka Papahana Kaiapuni celebration coincides with the 20th anniversary of KHʻUOK. Director Keiki Kawaiʻaeʻa says the murals commemorate the progress and revitalization efforts of the Hawaiian language through its Hawaiian medium-immersion educational pathway as Hawaiʻi prepares to mark next year’s 40th anniversary of ʻōlelo (language) Hawaiʻi as a state official language. The State of Hawai‘i ranks third in the country when it comes to states that are best at serving their older population. U.S. News and World Report based its rankings on the cost of care, nursing home quality, primary care and life expectancy. 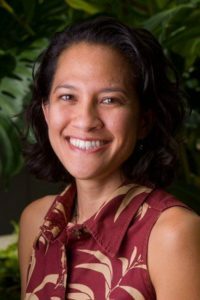 The publication says that Hawai‘i’s residents have the longest life expectancy in the U.S., with its 65-and-older population expected to live 20 years longer than in other states. U.S. News has also found that Hawai‘i has the best nursing home quality in the country. 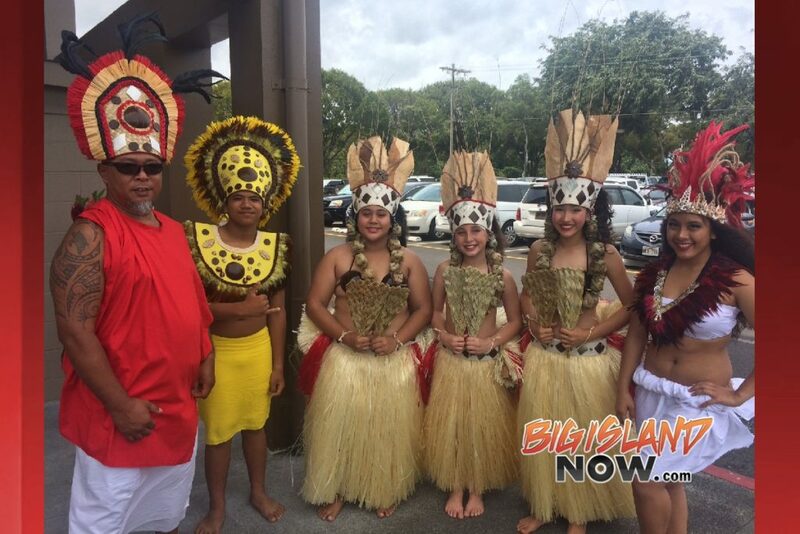 “It’s part of our culture in Hawai‘i to respect and honor our kupuna or elders. Our programs reflect these values and aim to keep our older population active and contributing members of society,” said Gov. David Ige. Colorado ranked first, with one of the healthiest and most physically active older populations in the country. Maine is second, where a fifth of the population consists of residents 65 and older, a higher percentage than in any other state. Rounding out the top 10 are: Iowa, South Dakota, Wisconsin, Minnesota, Vermont, New Hampshire and Florida. In 2016, Americans 65 and older accounted for 15.2 percent of the total population, an increase of 2.8 percent from 2000. Not only are baby boomers aging, but advances in medicine and technology are resulting in a longer life expectancy. The U.S. Census Bureau predicts that one in five Americans will be 65 years and older by 2030. Since 1997, the Native Hawaiian Hospitality Association (NaHHA) has worked to promote Hawaiian culture, values and traditions in the visitor industry and beyond through consultation and workforce education, and to provide opportunities for the Hawaiian community to shape the future of tourism. 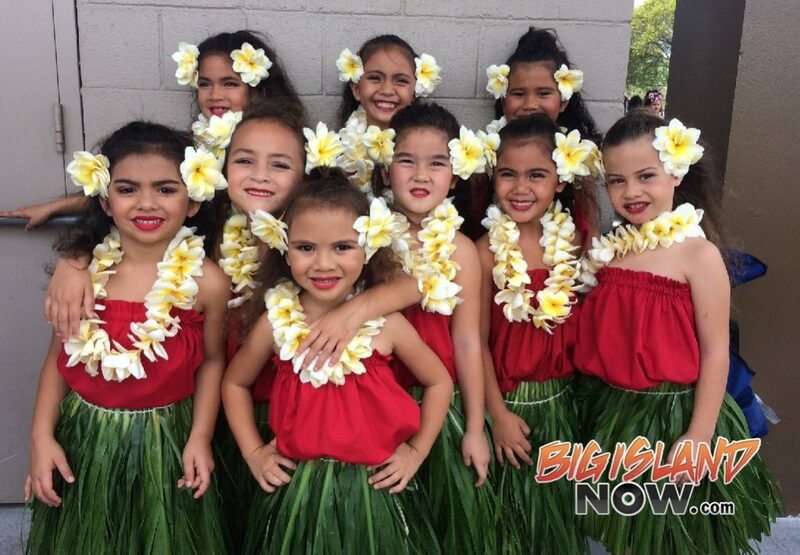 Now in its 20th year, join NaHHA in celebrating two decades of service to Hawai‘i with two events in Waikīkī, October 28 and 29. On Saturday, October 28 from 5 – 9 p.m., the community is invited to a free ‘Aha Mele: an evening of Hawaiian music at the Royal Hawaiian Center’s Royal Grove in the heart of Waikīkī. 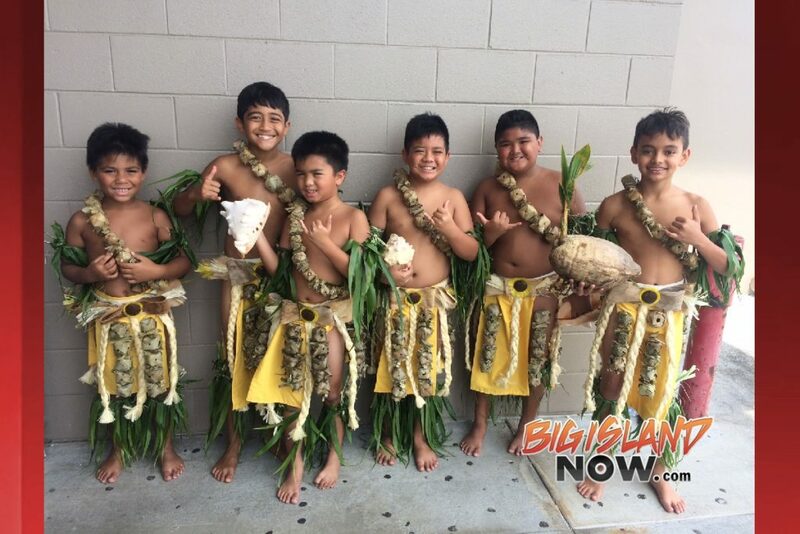 Presented by the Hawai‘i Tourism Authority in partnership with Hawaiian 105 KINE and NaHHA, this event will feature the Sons of Waikīkī, Hālau ‘O Kaululaua‘e, The Pandanus Club featuring Waikīkī legends Danny Kaleikini and Marlene Sai, and Amy Hānaiali‘i. On the evening of Sunday, October 29, NaHHA celebrates two decades of service with an Anniversary Gala at the Royal Hawaiian Hotel. The gala will feature cuisine from the chefs at the Royal Hawaiian Hotel, a silent auction, mo‘olelo (stories) from people involved with NaHHA and the visitor industry over the years, and a performance by Amy Hānaiali‘i sure to wow the crowd. The gala will celebrate the vision and contributions of NaHHA’s founders, the late George Kanahele, Ph.D, and the late Senator Kenneth Brown. NaHHA will also honor the memebrs of its founding Board of Directors: Muriel Anderson, Peter Apo, Cy Bridges, Doug Chang, John DeFries, Albert Kanahele, Noelani Mahoe, Jace McQuivey, and Lori Sablas. 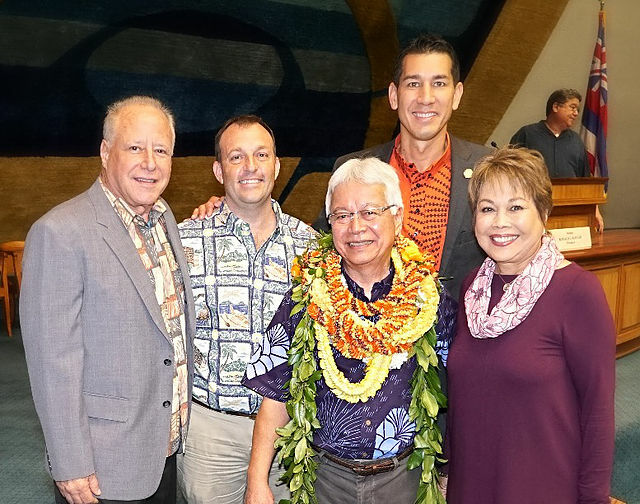 “This celebration will honor the rich history of the Native Hawaiian Hospitality Association and the many hands who have ensured our success in the years to come. We hope you can join us in celebrating the contributions and vision of our founders, and the mission we work toward every day,” said Pohai Ryan, Executive Director of NaHHA. Individual seats and tables are available for the gala. To reserve your seat at the gala, visit nahha20gala.eventbrite.com or call NaHHA at (808) 628-6374. Individual seats and tables are available. In designating 2017 as the International Year of Sustainable Tourism for Development, the United Nations General Assembly noted “the importance of international tourism in fostering better understanding among peoples everywhere, in leading to a greater awareness of the rich heritage of various civilizations, thereby contributing to the strengthening of peace in the world.” Twenty years ago, George Hu‘eu Sanford Kanahele, Ph.D. and Senator Kenneth Francis Kamu‘ookalani Brown had reached similar conclusions as those being expressed today by the United Nations. Inspired by a shared vision of Hawai‘i where Hawaiian culture and the visitor industry can strengthen and enrich one another, Kanahele and Brown co-founded the Native Hawaiian Hospitality Association to shape the future of Hawai‘i tourism by utilizing Hawaiian cultural values as the foundation for business development and leadership. Intuitively, they knew that Hawai‘i’s rare gift to the world is the Aloha Spirit and by sharing this gift, the world would become a better place and the spiritual essence of Hawai‘i’s people would be recognized and respected globally. Today, NaHHA fulfills the vision of its founders by delivering Hawaiian cultural training and consultation to the visitor industry workforce, as well as businesses and organizations that support the visitor industry. Learn more about NaHHA’s offerings at NaHHA.com. For weeks, thousands flocked to Kaimana beach to get a glimpse of the Hawaiian monk seal “Rocky” and her new pup, “Kaimana.” The new pup, the first born in Waikīkī in decades, captured the hearts of millions across Hawai‘i and the world. Now, some lucky individual will have the opportunity to “adopt” the pup at an upcoming fundraiser for marine mammal conservation. Kaimana and three other monk seal pups born this year will be up for “adoption” at the event. The “adoption” includes a large individual framed photo of the pup, a certificate of “adoption,” and an opportunity to visit your “adopted” pup with a monk seal volunteer team (conditions apply). All of this and more will be part of an event Dolphin Quest Oahu and The Kahala Hotel & Resort are hosting to raise funds for Hawai’i Marine Animal Response and their extraordinary network of volunteers who help to preserve Hawaii’s protected marine species. The event takes place on Friday, October 20, 2017 at The Kahala Hotel & Resort (5000 Kahala Ave, Honolulu, HI) from 5 p.m. – 8 p.m. The event will feature live Hawaiian music from five-time Nā Hōkū Hanohano Award winners Waipuna, delectable food and drinks from The Kahala, and a silent auction featuring local fashion and art. Hawaiʻi Marine Animal Response (HMAR) is Hawaii’s largest non-profit marine species conservation and response organization. HMAR covers approximately 300 miles of coastline on the islands of Oʻahu and Molokaʻi with a support staff of volunteers, interns and employees. Members of this staff are deployed to the field in response to sightings and to perform surveys, outreach activity, and interventions nearly 9 times per day, on average. Their past annual activity includes over 2,400 protected marine species sightings, over 2,700 occasions of team members engaged in shoreline responses and surveys, and over 50 Hawaiian monk seal and sea turtle related escalations or emergency responses. Proceeds from the event will go to much needed supplies and equipment for the organization. “We are a small organization with some mighty big responsibilities on our hands, but we have a team of passionate volunteers and staff who dedicate thousands of hours of their time caring for the animals they love. This event is both an opportunity to thank them and to raise money for our nonprofit,” explains Jon Gelman, founder of HMAR. E Ho‘onui i ke Aloha no ke Kai Ola (To increase our aloha for the living sea) is a benefit for Hawai‘i Marine Animal Response (HMAR) and their network of staff and volunteers who help to preserve Hawaii’s protected marine species every day. This public event will be held at The Kahala Hotel & Resort, and it is sponsored by Dolphin Quest Oahu. HMAR also conducts public outreach and education for schools, the public and Hawai’i organizations. Earlier this year, Dolphin Quest was recognized by HMAR as a Hawaii Marine Animal Steward in partnership with Hawai’i Tourism Authority. Dolphin Quest provides ongoing support and hands-on training for Hawai’i’s stranding network volunteers. In May of this year, Dolphin Quest hosted veterinarians from multiple Hawaiian islands providing valuable experience with healthy dolphins to aid their wild stranding response efforts. Tickets to the event are available for purchase online for $125 per person as well as premium sponsorship packages for $1000. Availability is limited and the organizers are urging the public to secure tickets as soon as possible to attend this evening of music, food, festivities and marine animal conservation. Tickets include a gift, heavy gourmet pūpū, and signature non-alcoholic drinks. $1000 Sponsorships include five tickets to the event and promotion of a business or organization in the program and leading up to the event. In keeping with its commitment to foster sustainable tourism in the Hawaiian Islands, the Hawaii Tourism Authority (HTA) is providing funding of more than $3.5 million to 124 programs that are perpetuating Hawaiian culture, protecting natural resources and showcasing community events in 2018. 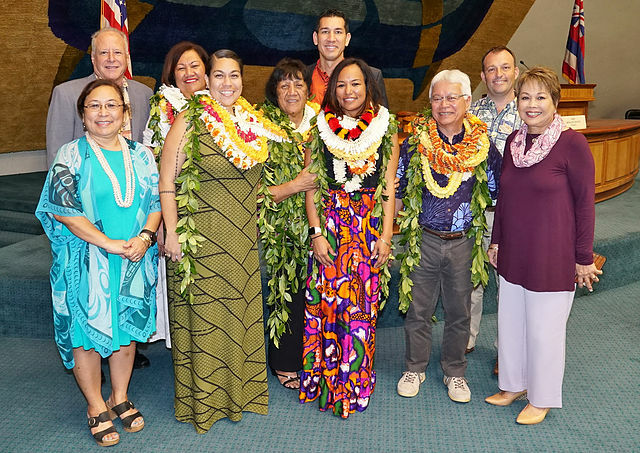 Recipients of the funding are nonprofit groups, community organizations and individuals statewide who have demonstrated through proposals submitted to HTA their dedication to strengthen the enduring qualities of Hawaii’s legacy that distinguish the islands as a place to live and visit. Funding is being provided to recipients on all islands for usage in 2018 as part of three HTA program categories: Kukulu Ola, Aloha Aina and Community Enrichment. HTA issued a request for proposals on June 21 with submittals from qualified applicants received by August 4. 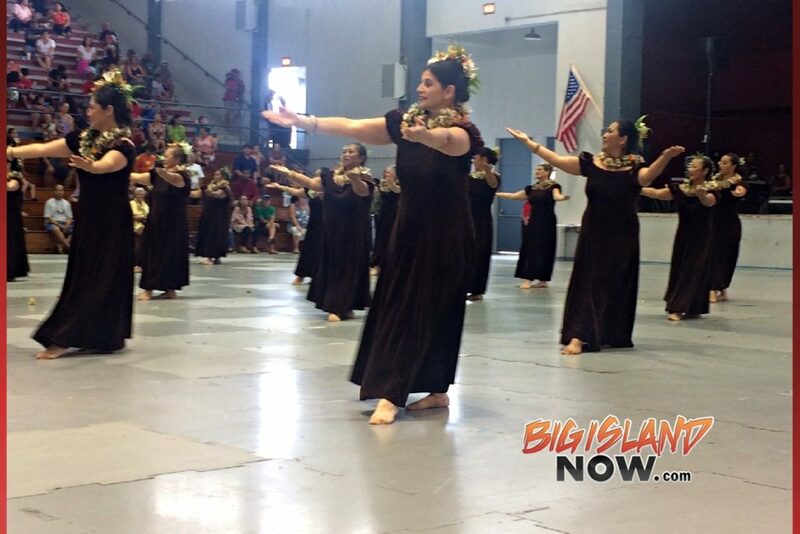 A total of $1,240,000 is being awarded to 33 recipients that are perpetuating Hawaiian culture through HTA’s Kukulu Ola program. Awardees include community groups, practitioners, craftsmen, musicians and artists committed to strengthening a broader understanding and appreciation of Hawaiian culture through place-based activity engagement. Founded on the value of ma ka hana ka ike (in working one learns), the Kukulu Ola program assists recipients steeped in ike Hawaii to share within communities the Hawaiian values inherent in each respective practice. 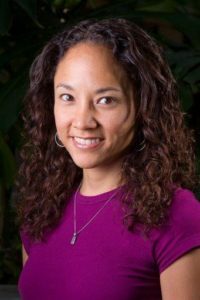 A total of $1,150,000 is being awarded to 26 recipients that are helping to protect Hawaii’s natural resources through HTA’s Aloha Aina program. Focused on the lasting value of stewardship by responsible community-based entities that emphasize aina-kanaka relationships and knowledge, the Aloha Aina program supports efforts to manage, conserve and revitalize Hawaii’s natural resources and environment. A total of $1,153,300 is being awarded to 65 recipients through HTA’s Community Enrichment program, which supports quality experiences created by communities to be shared with residents and visitors for their enjoyment. The Community Enrichment program invests in a diverse array of festivals, events and year-round programs in support of culture, education, health and wellness, nature, agriculture, sports, technology and voluntourism. Click here for the listing of awardees receiving funding from HTA. Thanks to support from University of Hawaii Press and Kamehameha Schools, the public now has free access to the bestselling book Broken Trust: Greed, Mismanagement & Political Manipulation at America’s Largest Charitable Trust. Local and national publications praised Broken Trust; Hawaii Book Publishers Association named it Book of the Year; and numerous high schools, colleges, and law schools have used Broken Trust in courses such as Modern Hawaiian History, Participation in Democracy, Trusts & Estates, Nonprofit Organizations, Federal Taxation, Fiduciary Administration, and Professional Responsibility. The book’s surviving co-author, Randall Roth, explains in the open-access introduction that he and Judge Samuel P. King wrote Broken Trust to help protect the legacy of Princess Bernice Pauahi Bishop. They assigned all royalties to local charities and donated thousands of copies to libraries and high schools. Source documents, legal issues, discussion questions, and lesson plans are available at www.BrokenTrustBook.com. The Board’s decision today is the latest milestone in what has been a complex journey. I believe Hawai‘i can host a new telescope in the right way, with respect for the values, traditions and culture of the first Hawaiians, and that our island state can be Earth’s eyes into the universe to prepare for a brighter future.